Have too much zucchini? 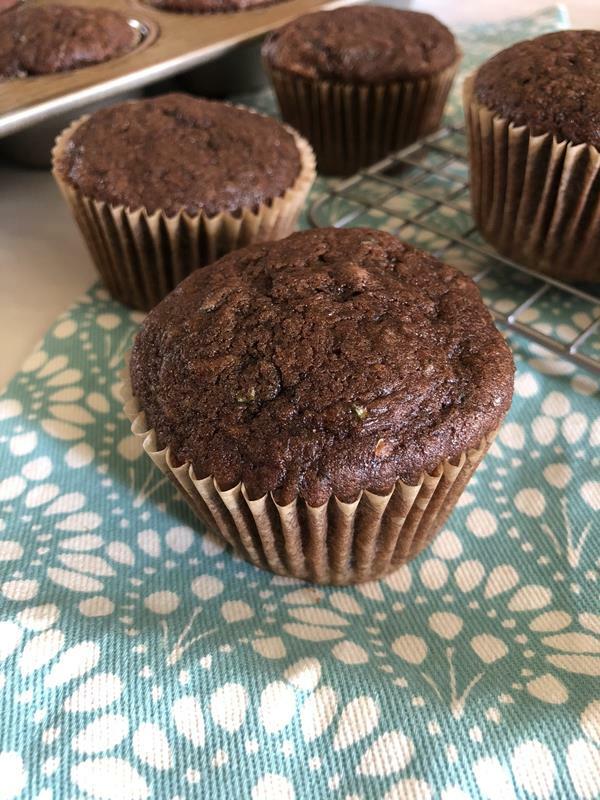 These Chocolate Whole Wheat Zucchini Muffins are a delicious way to use up that extra zucchini you might have. If you are like me you have a lot of zucchini right now. It might be the end of the summer, but often times the zucchini is still going strong. What do you do when you have too much zucchini. You find all kinds of creative ways to use it. My family gets tired of the ways we normally eat it, so I am always trying to come up with new recipes to make. I thought muffins sounded good, but I did not have a zucchini muffin recipe. I decided to try to come up with my own. I tweaked a recipe, added some whole wheat, changed the liquid to buttermilk and gave it a try. It worked great. My kids loved these. We had them for an afternoon snack and again for dessert the other night. These were so easy to make and they used what I had. Plus they are semi healthy. I used part whole wheat in this, but you could use all regular flour if you like. I like the idea of using part whole wheat to make them healthier. 2018 update: I now eat gluten free so I make these with Bob’s Red Mill 1 to 1 Flour Blend and they turn out great that way too. Need some more ideas for using up zucchini? Place grated zucchini in a strainer and drain as much liquid off as you can. Set aside. Cream together butter, oil and sugar. Add eggs, buttermilk, and vanilla. Blend well. Mix dry ingredients into the butter mixture until combined. Add grated zucchini, and mix until combined. Scoop into muffin pan lined with paper liners or greased well. Bake at 325 degrees for 18-20 minutes. 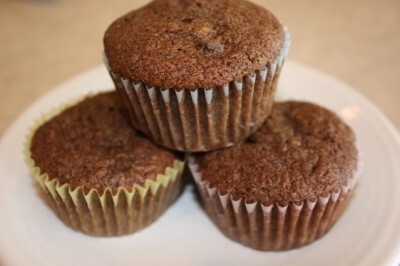 Note: I have also made these gluten free using Bob’s Red Mill 1 to 1 Blend in place of the whole wheat and all purpose flour and it works great. yum! 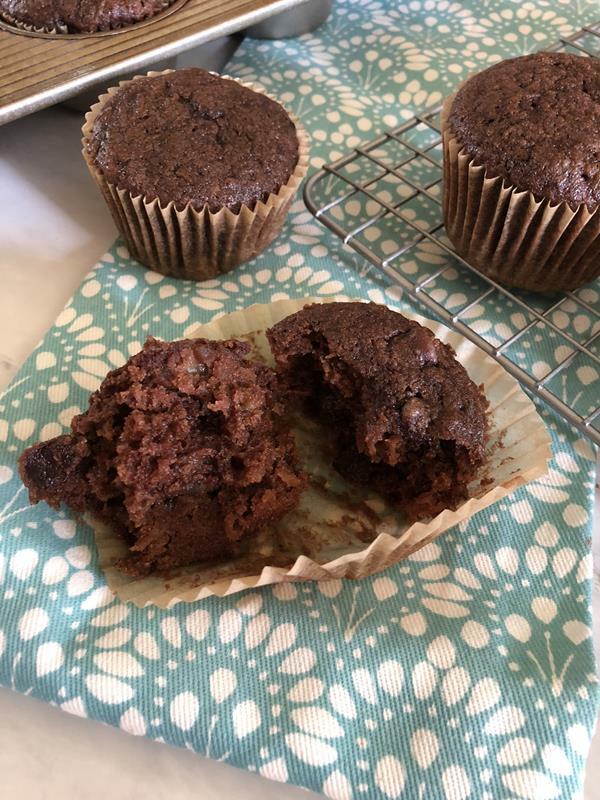 This reminds me of my mom’s chocolate chip zucchini cake recipe made into muffins 🙂 I’ll have to try it. Yummy, I have a similar chocolate zucchini Cake recipe. I bet these were good. here’s the link if your interested. Gonna add these to my “batch cooking” list for foods to freeze before baby! 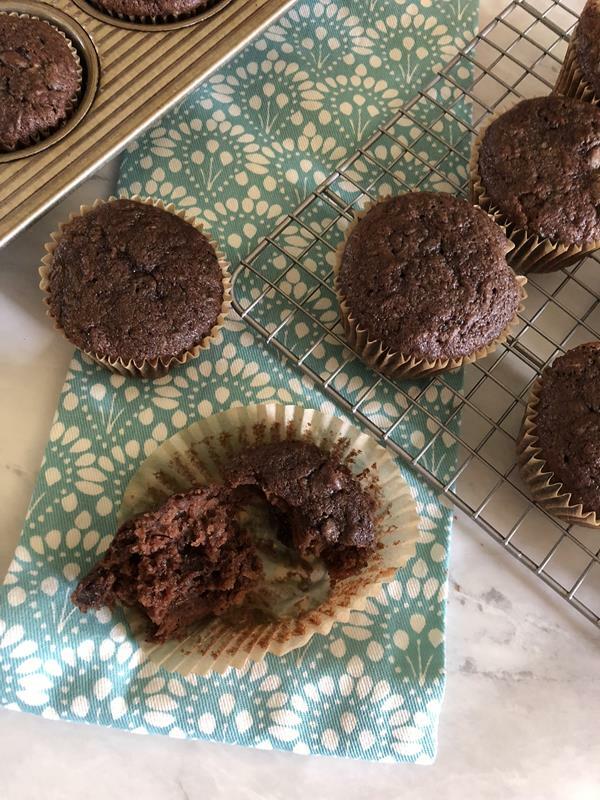 Chocolate and zucchini go so great together – and I love the addition of whole wheat flour – will have to try this when my zucchini are ready to eat! 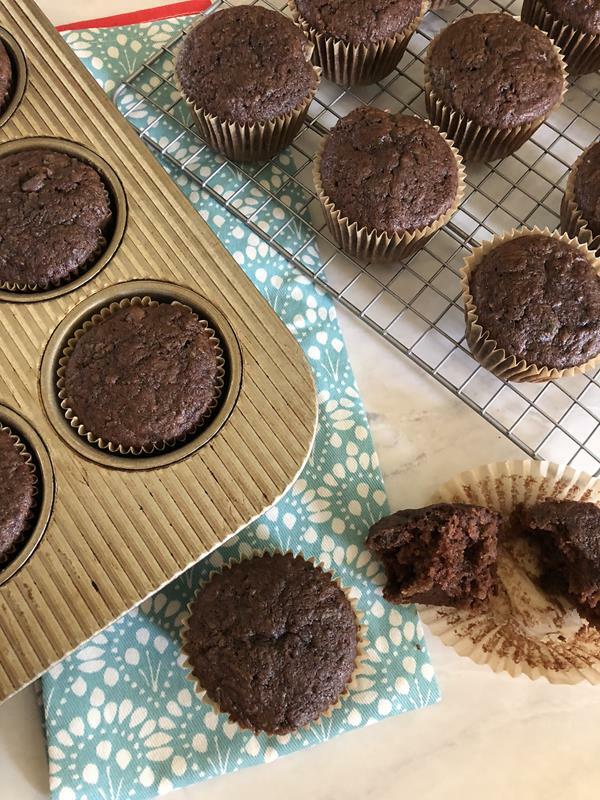 Those chocolate muffins look yummy. I don’t know if I’m ready to venture into making anything baked with zucchini just yet. Chocolate and zucchini is an unbeatable combination. I love this. Definitely going to have to try these! These were absolutely delicious. I used applesauce instead of oil and added 1/4 c milled flax seed. Made a big batch so froze 1/2 for later. Thanks! These look fabulous. Problem, I don’t have any zucchini! Is there something else I can substitute i.e. carrot or can I just skip the veggies and add oats to give it substance. I would love to try these tomorrow morning! Marjorie, I would try carrots in place of zucchini. I am not sure how it will turn out, but I think that may work best. Zuch is more moist than carrots. So, I would prob. put fewer carrots in than I would zuch. If you try it let me know how it turns out. These muffins are beyond scrumptions! They baked up moist, and chocolately, and delicious. I made the recipe exactly expect that I omitted the salt (never use the stuff) and used 1 cup of chips. Super yummy! Thank you for the great recipe. I will make these again,a nd again, and again. So yummy! I’ll be making these again as well. Thank you! I love these muffins. I did make a couple of changes. Instead of oil I used non sweetened apple sauce. I also substituted half of the sugar with splenda. This recipe looks great! I’ve been wanting to get a bag of wheat flour to try in baking, and this will be my first recipe to try. Oh, and I’ve got several cans of unsweetened applesauce in my pantry, so I’ll substitute for the oil. I can’t wait to try this out! Lynn, these look yummy!! I started using freshly ground whole wheat flour so I definitely want tasty recipes. Do you think if I melted the chocolate chips, it would still have the same chocolate flavor. I like melted chocolate but not chips in muffins (I love them in cookies so I know I’m weird). @Andrea @ MommySnacks.net, Melting them might work, but I it might also change the texture some. It would be worth trying. You could also just leave them out, they just would not be as chocolatey (if that is a word). And I have quite a few WW recipes on my site. My chocolate banana cookies have part ww and kids love them.https://www.lynnskitchenadventures.com/2008/11/banana-chocolate-cookies.html and I have others too. I ground all my own wheat before I had to go GF, so I tried it in a lot of things. I made your muffins and oh my we love them. They are so moist. Thanks for a grea recipe. @Crystal, I am so glad that you liked them! Can you substitute sour milk for buttermilk? I want to make these this weekend for a class I’m helping with. @beingjennifer, I have never tried it, but yes I think it would work fine. I hope you enjoy them! @Alissabeth, These freeze great. I have done it many times. Coming from a family of very picky eaters, how strong is the zucchini flavor? Also, wondering if you could substitute stevia in place of the white sugar and would it be the same measurement? That just seems like a lot of sugar? Thank you!